Kenya's president and opposition leader say they met for talks Friday, months after the presidential elections sparked turmoil as the opposition charged there was electoral fraud. Kenya's president and opposition leader said they met for talks Friday, months after the presidential elections sparked turmoil as the opposition charged there was electoral fraud. It's not known if demands by Odinga for new elections were discussed and journalists were not allowed to ask questions when the announcement was made. The announcement came with U.S. Secretary of State Rex Tillerson beginning a three-day visit on Friday, but Odinga's spokesperson Dennis Onyango refused to link the two events, calling it a "purely domestic initiative." Kenyatta and Odinga met publicly at a funeral service where they shook hands earlier this year, but they did not have talks. Odinga said Kenya has never dealt with the challenges "that our diversity [different tribes] was always going to pose to our efforts to create a prosperous and united nation ... The time has come for us to confront and resolve our differences. These differences are becoming too entrenched." Odinga's and Kenyatta's fathers were allies in the struggle for Kenya's independence from British colonial rule and then became adversaries. Now Kenyatta and Odinga have extended the family rivalry by ethnic allegiances and personality politics. The two men, who also faced off in a 2013 election marred by opposition allegations of vote rigging, are vying for power in East Africa's economic hub that plays a key role in the Western-backed fight against neighbouring Somalia's Islamic extremists. For many observers, the historical divisions between the Kenyatta and Odinga dynasties and the ethnic groups they represent cloud the promise of Kenya's democracy. On Friday, Kenyatta said he and Odinga had reached an understanding "that this country of Kenya is greater than any one individual. And for this country to come together, leaders must come together." 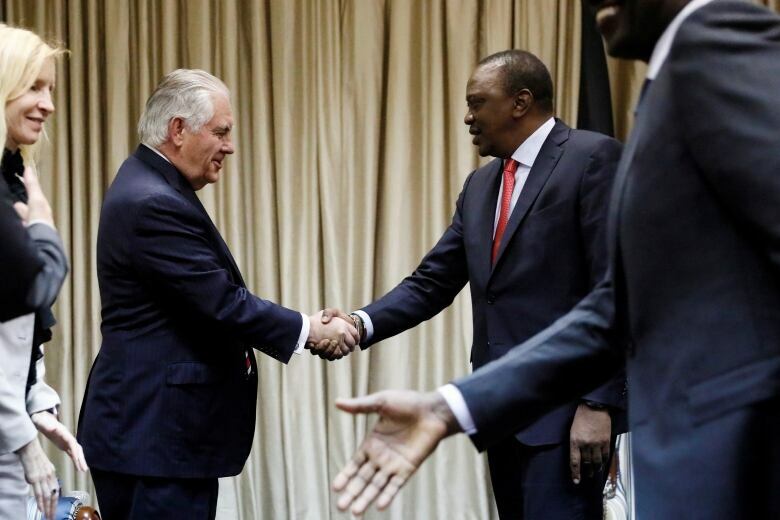 "This is a very positive step in our view, and while we know addressing Kenya's ethnic and political divisions will take some time and effort, today both of these men showed great leadership in coming together," Tillerson said after meeting Kenyatta. "All the credit goes to the two leaders." 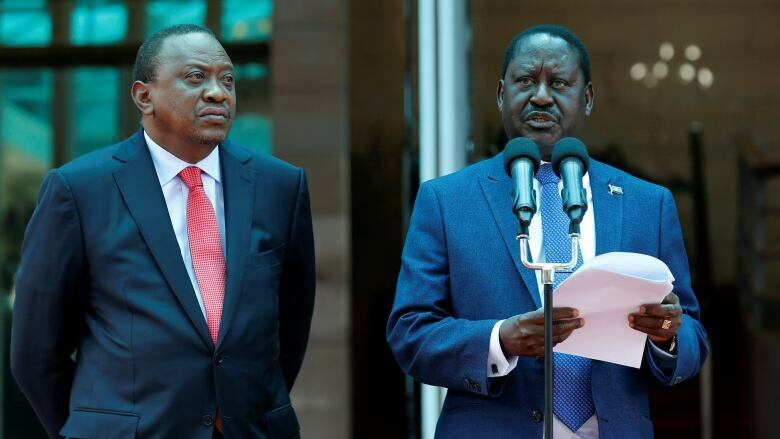 Kenyatta and Odinga said in a statement they have agreed to establish a new office staffed by advisers to tackle the divisions ranging from opposition complaints over the election to tensions between ethnic groups and corruption. Odinga pressed a lawsuit challenging Kenyatta's victory in last year's August election and the Supreme Court ordered a new election. Odinga boycotted the repeat election in October, saying adequate electoral reforms had not been made. International organizations Amnesty International and Human Rights Watch said as many as 67 people died as a result of clashes and brutal repression between the two votes. 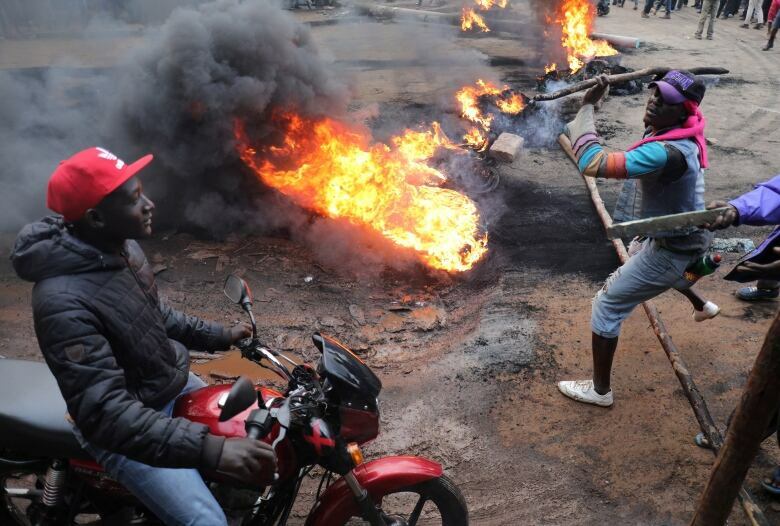 Ethnic violence led to the deaths of over 1,000 people after the 2007 election. On Jan. 30, Odinga held a protest event which was a mock inauguration in which he was sworn in as the "people's president." The government reacted by shutting down some broadcasters and arresting some participants. Moses Kuria, a legislator for Kenyatta's Jubilee party said the meeting could be the start of ending the cycle of disputed elections and their ruinous impact on economic growth. "We are the only country that goes for elections and ends up with an economic slump … It is good for the country," said.